This dish, is called Gyu-katsu, served at a place called Izawa. I don't know why they call it that, neither do I know what it means. 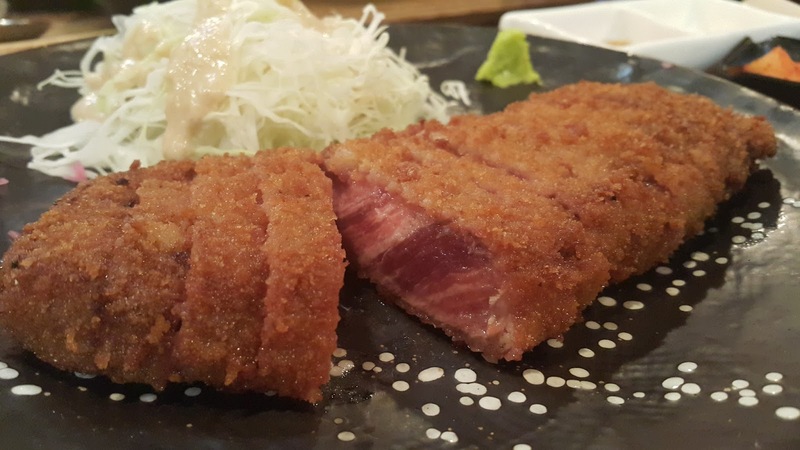 But well, as you know a tonkatsu is a strip of pork sirloin that is deep fried with a breadcrumb crust. This, on the other hand, is a slab of beef steak sirloin with the crust. However, it is deep fried in a state which I assume to be frozen so that the middle is still rare. The interesting thing about beef is how much better it tastes when it's still medium-rare to medium. 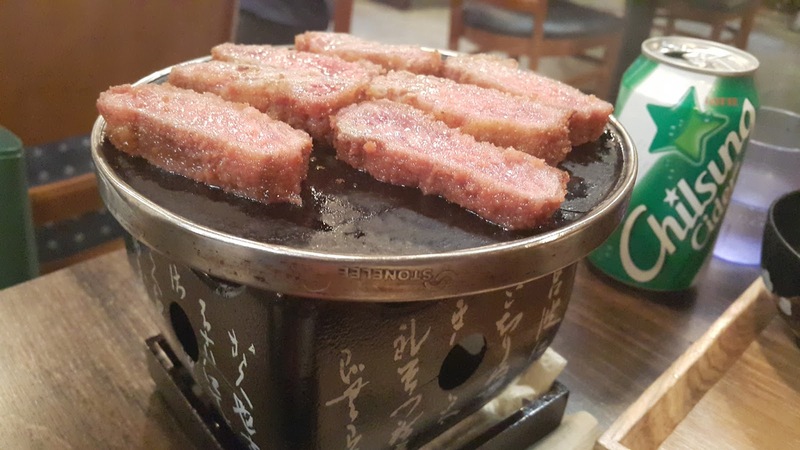 Anyway, this place is located in Sinchon, if you're interested in getting your beef fix. 규카츠라는 건데 이자와에서 판다. 돈카츠랑 같이 생겼는데 돼지고기 대신에 소고기다. 외면은 바삭바삭한 껍칠에 익지 않은 소고기. 신촌에 있는 맛집 하나인데 소고기 땡기면 먹으러 가보세요! If you;d like to head down there, the address is: 서울특별시 서대문구 연세로 29 지하1층. The website can also be accessed here. When you enter the place, you'll be seated in a really stylish yet antique looking restaurant. I really liked the ambiance and feel. 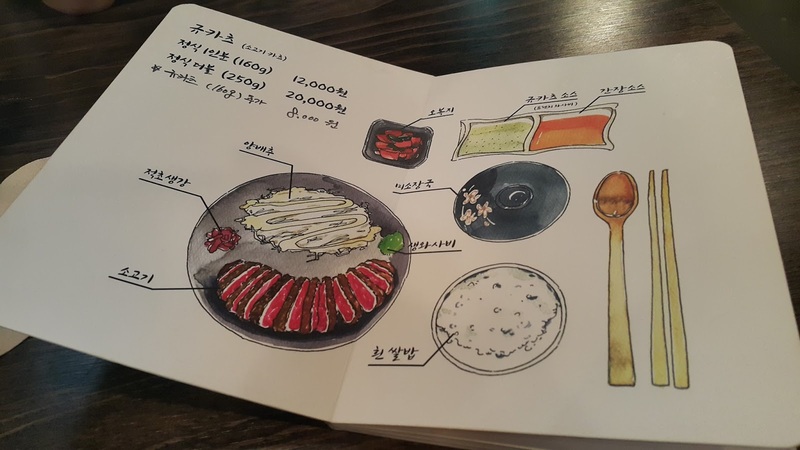 So if you take a look at their menu, you can tell that they have a few signature dishes that you have to try. 주소는 서울특별시 서대문구 연세로 29 지하1층이고 웝사이트는 이자와라고 검생하면 나온다. 식당은 분위기도 좋고 실내 장식도 이쁘다. 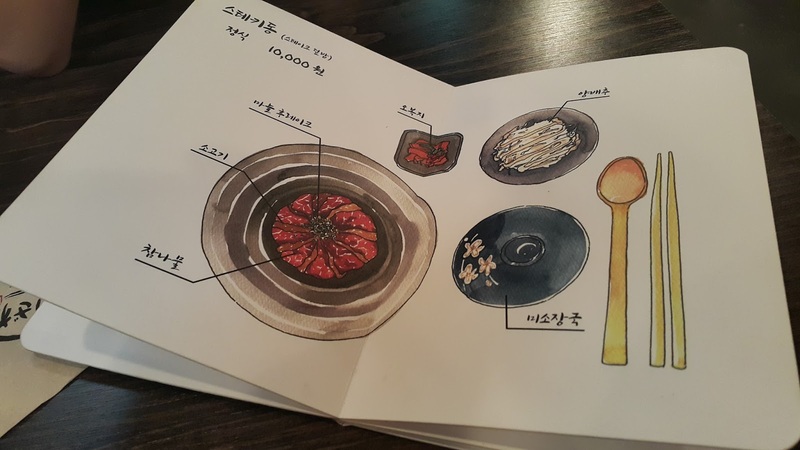 메뉴를 딱 보면 가장 유면한 요리가 눈에 뜨이다. We just ordered the first set as it had a mix of both dishes that we wanted to try. 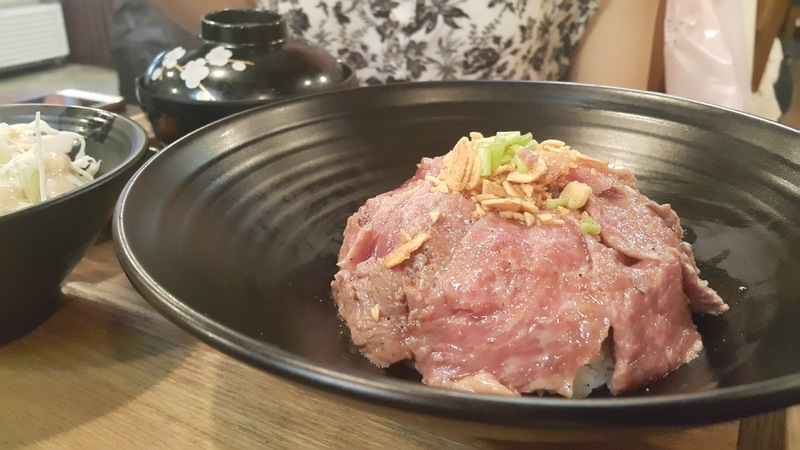 The first one is the steak-don which was rice with many slices of rare beef. The second dish was what I mentioned in the beginning of this post, the beef sirloin deep fried but retaining its rareness. 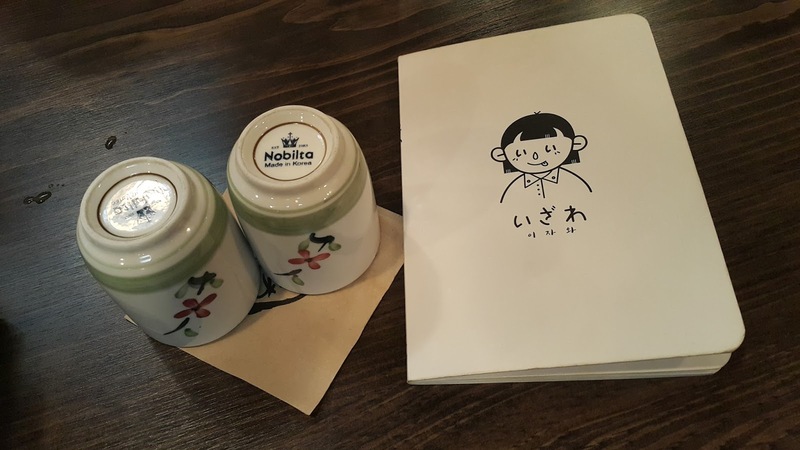 다양한 것을 먹고 싶어서 세트일을 시켰다. 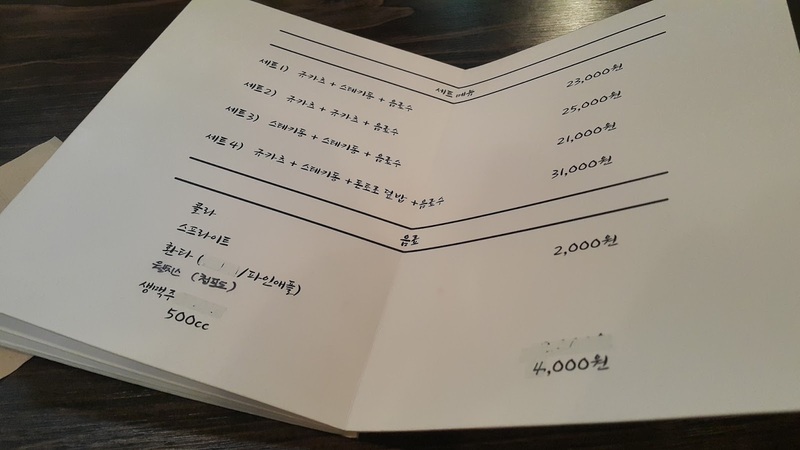 첫째건 카츠돈 같이 생겼는데 위엔 소고기다. 두번째건 규카츠! 너무 맛있겠고 예쁜 고긴데 카메라가 먼저 먹어야지. 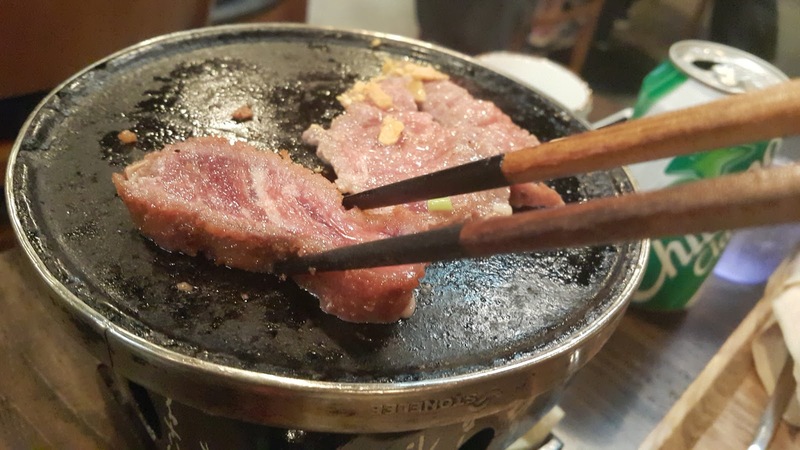 However, the main interesting thing about this place is, much like many Korean restaurants, you cook your meat. They have a mini stove that is actually fueled by a huge thick chunk of solid fuel and a marble cooking plate on top. So you put your steak on it and cook them to how you like it before eating it. 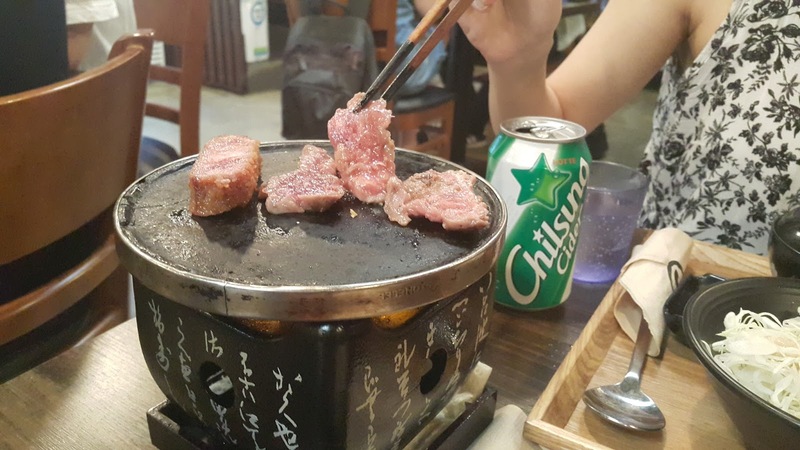 It was a really interesting experience cooking on a "mini pan" and the beef was really great. 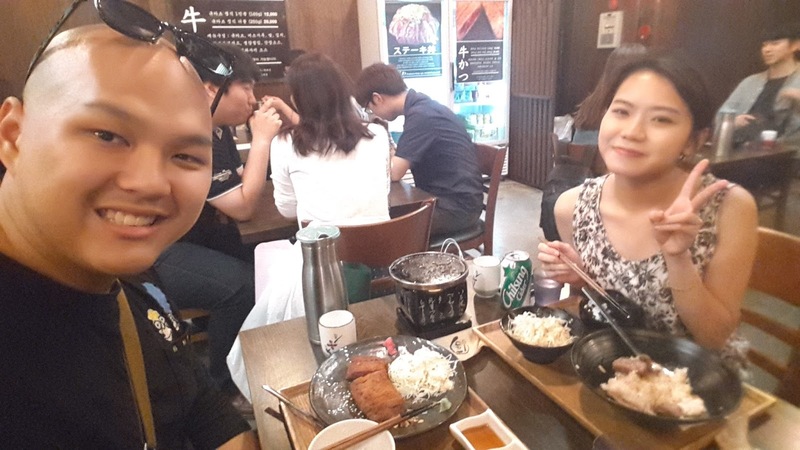 Considering that it's not expensive at all to have beef here in Korea as compared to Singapore, definitely a must-go to try if you're around the neighborhood. 여길 왜 추천하냐면 한국의 많은 식당이랑 같이 자기가 음식을 구워 먹어야 하는 식당인데 이렇게 해야 된다. 엄청 맛있었고 스테이크 같은 소고기를 좋아하신다면 꼭 가봐야겠음!! 음식도 그렇게 비싸지도 않고 (싱가포르에 비하면은 ㅋㅋ) 양이 좀 많을 편이라서 시간이 되거나 갑자기 소고기 생각 들면 가보세요!